Melanie Espinal and Chloe Gorman, journalism students at Southern Connecticut State University, reported this story in 2017 as part of Journalism Capstone coursework on World War I. When the United States joined World War I, nearly 5,000 Connecticut women were ready to serve as nurses on the battlefields, according to the 1918 Report of the State Military Census on the Nurses and Nursing Resources. 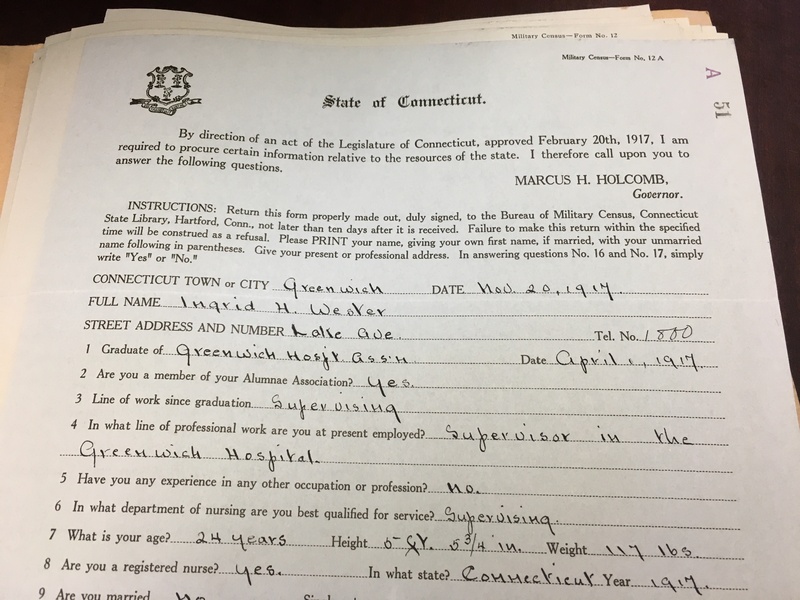 The report summarized a February 1917 survey that asked Connecticut nurses about their qualifications. The survey, which was commissioned by former-Governor Marcus H. Holcomb in the months leading up to the United States involvement in the war, is likely the only one of its kind in the nation. Its purpose was to provide information to assess the skills of nurses in Connecticut who could be available for immediate response in times of emergency, and the level of formal education. Nurses were split into four different groups: practical nurses, registered nurses, pupil nurses and non-registered nurses. R. Inde Albaugh, author of the report and secretary of the Connecticut State Board of Examination and Registration of Nurses, publicly acknowledged the impact of Connecticut nurses in the report. Kimberly Harke , a volunteer tour guide at the Putnam Cottage, which houses the collections of the Putnam Hill Chapter of the Daughters of the American Revolution chapter, said nursing was the most common way in which women joined the military. Many nurses got involved by joining the Red Cross, while others joined the U.S. military. Those nurses helped pave the way to granting access for women in the military. 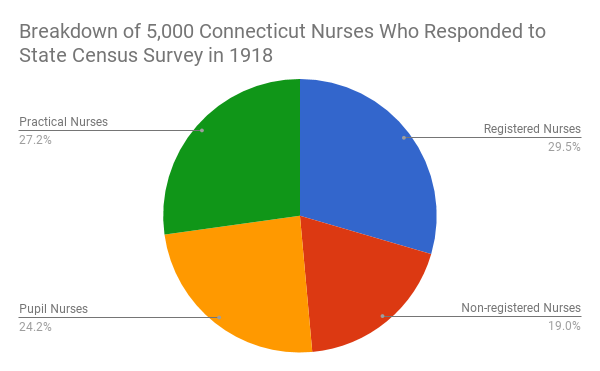 A pie chart of the breakdown of Connecticut nurses by class. Source: Report of the State Military Census on the Nurses and Nursing Resources (1918). One such woman who pushed boundaries within the military was New Haven resident Esther Voorhees Hasson. In 1917, Hasson was stationed in France as an Army Reserve nurse, but had 20 years nursing experience before that station. “Her serving in World War I, really her whole life led up to that,” said Esther Kelly, Hasson’s great-great-niece. Hasson graduated from the Connecticut Training School for nurses in 1897, and went on to serve in Cuba in 1898 as a contract nurse for the U.S. Army on the USS Relief. 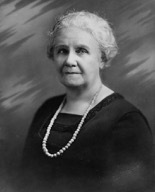 When former-President Theodore Roosevelt signed the Naval Appropriations Bill establishing the first Nurse Corps in 1908, Hasson became the first superintendent of the “Sacred 20,” the first 20 Navy nurses, according to Kelly. However, incorporating women into ranks was still a hard concept for the Navy, according to Kelly and Toby Appel, a research affiliate for the Harvey Cushing/John Hay Whitney Medical Library in the Yale School of Medicine. “Because they didn’t have military rank, it was not clear their authority over doctors, orderlies, or other nurses,” Appel said. This also became apparent to Hasson in 1917, when she joined the U.S. Army Reserve Nurse Corps, serving in Europe at the beginning of World War I. When the Army wanted to pay her the lower wages of a new nurse, Hasson fought it and brought the case to the judge advocate general. Despite how many women were willing to go overseas for the war efforts, Navy nurses didn’t receive relative rank until July 1942, according to Kelly, and weren’t awarded full military rank until February 1944. This was the reality for many nurses of Connecticut. Even though these women were trailblazers in a relatively new profession, not receiving a formal rank or equal pay was common. When Hasson served she had no rank; when she retired she received no benefits, Kelly said. Although Hasson and other Connecticut nurses weren’t recognized immediately by the U.S. government, their story undoubtedly made an impact on Kelly’s family.